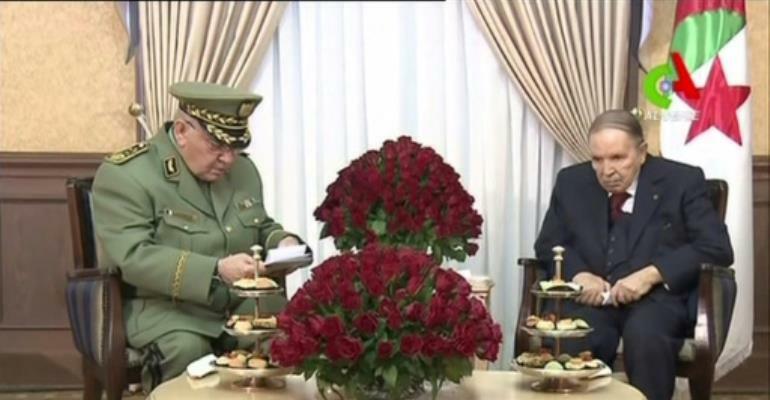 Algeria's military on Tuesday demanded the immediate launch of impeachment proceedings against President Abdelaziz Bouteflika as it dismissed an announcement he will resign before his mandate expires. Armed forces chief Ahmed Gaid Salah called for "the immediate application of the constitutional procedure for removing the head of state from power", in a defence ministry statement after a meeting of top brass. "Any decision taken outside the constitutional framework is considered null and void," the general said. He said the army's "sole ambition" was to "protect the people from a handful of (other) people who have unduly taken over the wealth of the Algerian people". Bouteflika has come under mounting pressure to step down since his decision to seek a fifth term despite rarely being seen in public after suffering a stroke in 2013. The 82-year-old, who uses a wheelchair, said last month he would pull out of the race and postponed April elections, in moves that angered protesters who saw it as a ploy to extend his two decades in power. Gaid Salah, a long-time Bouteflika ally, last week called on the president to resign or be declared unfit to rule, becoming one of the first of his faithful supporters to abandon him.